Picture taken in sunlight. This applied well, but I still needed three coats to totally cover up any dark spots. This isn’t my favorite out of the collection, but that’s only because I don’t like orange as much as other colors like pink or coral. Actually, the longer I have it on, the more it grows on me. This isn’t that kind of traffic cone orange that I usually see in orange neons. It’s much lighter, and has a strong yellow tone (though it still decidedly orange.) 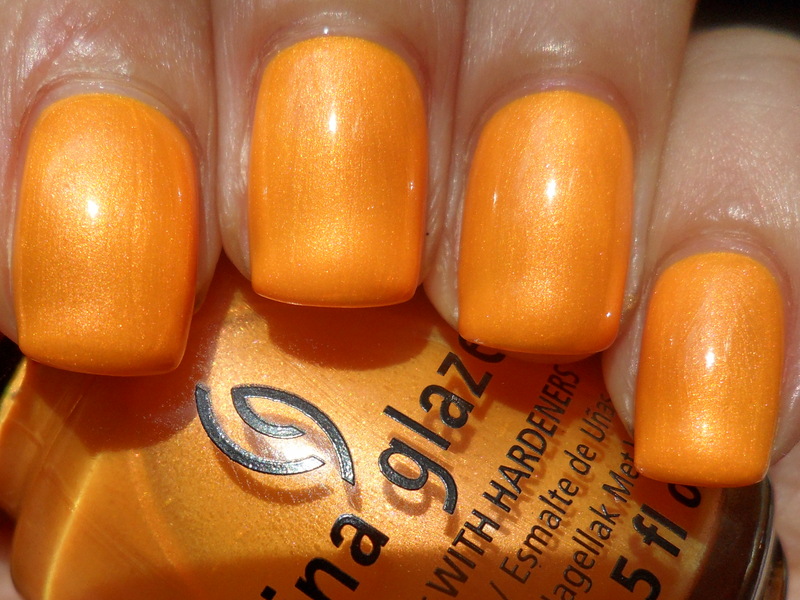 The color kind of reminds me of Tang. 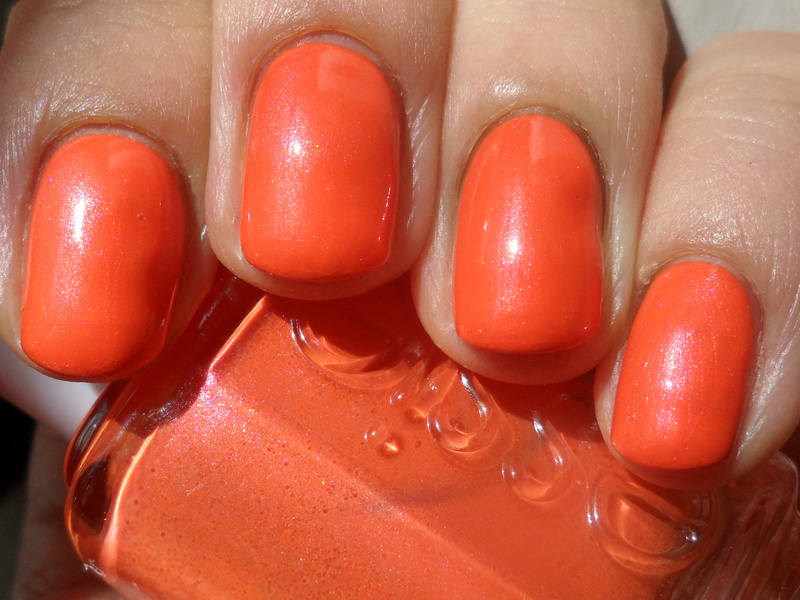 Although it’s not such a bold shade, it’s still bright and neon-like. The addition of the shimmer makes me like this more than if this was just a creme. 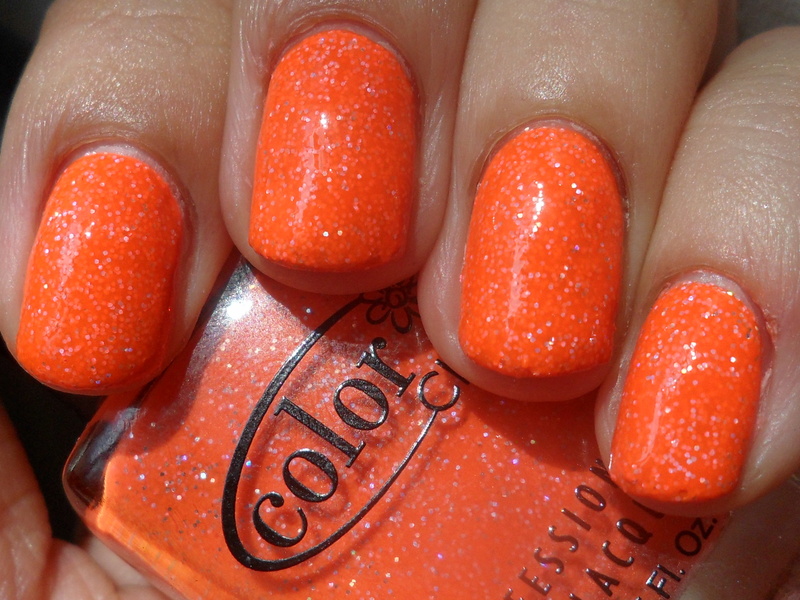 Like with all the other neon shimmers from this collection, the finish has a glowiness that emphasizes the neon quality. Overall, this was one of the best neon collections I’ve tried. My only gripe is that the formula is prone to tip pull (at least when used with a quick-dry topcoat.) But the range of colors and the lovely finish makes up for it. I paired this with NARS Ratin Jot on my toes. Picture taken in sunlight. This applied well, needing two coats for full coverage. Before it dried down, the formula looked and acted like a microglitter in a jellylike base, similar to China Glaze Riveting, with even more microglitter (and it would probably look similar to that if you were to add topcoat). But after this fully dries down, the gold glitter rises to the surface and the finish takes on that amazing glittery, textured look. It’s amazing that it’s so sparkly and not flat without topcoat, but I guess that’s just the magic of this Liquid Sand finish. Not only do I love the look of it, but I really love the gritty feel as well. This is mesmerizing to look at, particularly in direct light; it’s like being entranced by a flame! I paired this with Essie Braziliant on my toes. Picture taken in sunlight. This applied well; I got full coverage in two coats. 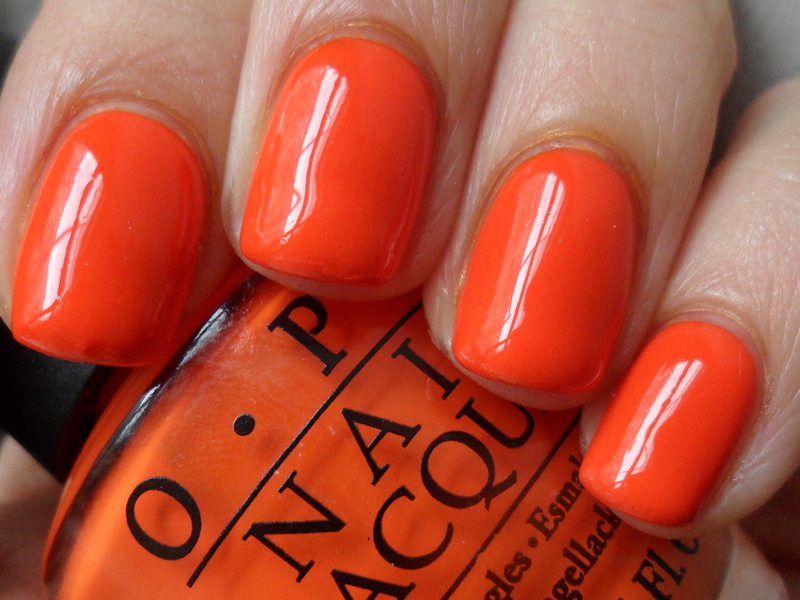 This is such a lovely, bold shade of orange. The finish is amazing! There’s something glass-fleck-y about it, in that the microglitter looks so well-defined even out of direct light. I don’t think the base is quite jelly-ish enough to call it a true glass-fleck, though. The addition of the gold microglitter really adds to the glowy, burning ember quality of the overall look. It makes me think of not just fire, but lava. 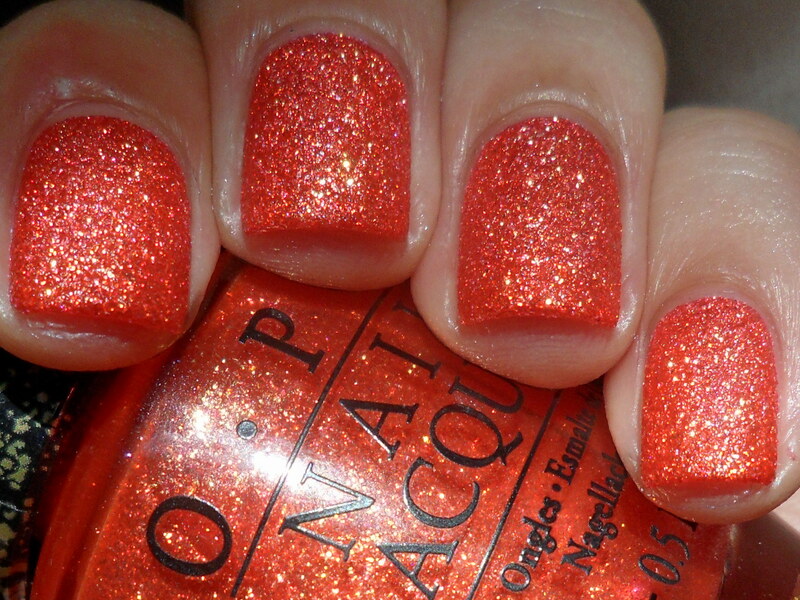 I doubled up on orange today and paired this with OPI A Good Man-darin is Hard to Find on my toes. Picture taken in sunlight. The formula was not as stellar as the others in this collection, but it still applied pretty well for a yellow-toned polish; I used three coats. With the other rubber brights I’ve tried so far, I’ve said that they look great in their original satin form, too, but I can’t say the same for this one. For me, I really needed topcoat to make everything appear smooth. As I’ve been wearing these polishes with topcoat I don’t see it as a drawback. I think the color really fits the name; it just seems like a happy-feeling shade. I can’t even decide if it’s yellow or orange, so I’m calling it both, but it tends to look more orange in low light and more yellow in bright, direct light. I wish it was more of a radioactive neon, but I still like its brightness. I can tell I’m hungry as I’m typing this, because the color just reminds me of egg yolks (of good eggs that come from free-range hens) and boxed mac and cheese. 🙂 I paired this with Misa Push Upon It on my toes. Picture taken in natural light. This applied well; it went on smoothly and was nicely pigmented, but I still needed three coats to cover up streakiness. This is really bright, like almost neon but not quite (it lacks that glow that would take it to neon territory). I don’t wear orange very often, and it’s not really a favorite color of mine, but this is definitely the kind of saturated, bright orange I love. Plus the name is pretty great, too. After a couple of disappointing location collections, I’m definitely looking forward to trying more from this one! I paired this with MAC Originality on my toes. Picture taken in sunlight. This applied well; I used three coats for an opaque, even finish. I’m not sure why this is called coral; it doesn’t have enough pink in it to look like a true coral. It’s orange, but it’s not traffic cone orange. The shade has a softer, sherbet-like quality to it. It probably does have some coral tones in it to make it look this way, but overall the color seems more orange. (Although not as orange as it appears in this photo. It was difficult to capture the true tone and sherbet-ness of the shade, but it does look just slightly more coral in real life.) Whatever it’s called, it’s such a pretty color! 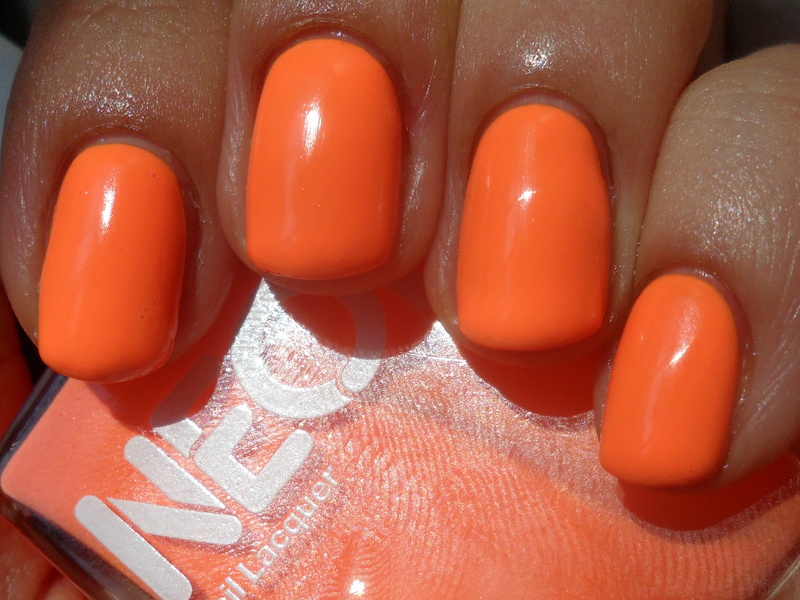 It looks so creamy, and the neon, slightly glowy quality also makes it look bright and punchy. I think I like this more than traditional orange! I paired this with Essie Haute as Hello on my toes. Picture taken in sunlight. (Pardon the bubbles!) This actually applied better than I expected; I had easy enough control over the formula, which was thick but runny. (I’ve come to expect this from most American Apparel polishes so it was no surprise.) It’s very pigmented, so I knew I would get an opaque, solid result, but I needed three coats to cover up streaks. It’s so refreshing to see more and more of these yellow orange type neons; it’s a change of pace from the standard traffic cone orange neon. 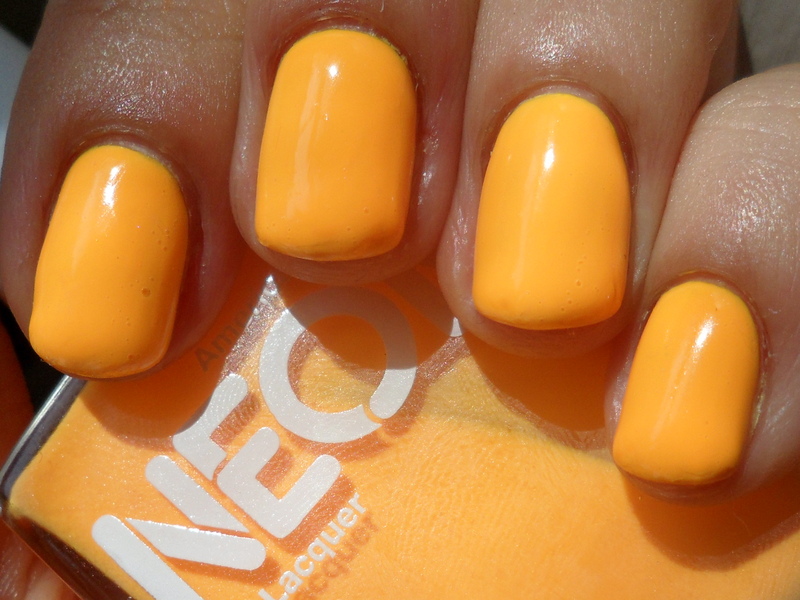 I’ve heard this color being described as looking like radioactive artificial cheese powder (indeed it does, it’s glowy like a proper neon), but it also reminds me of kumquats or cape gooseberries, yum! I paired this with Essie Bright Tights over white on my toes. Picture taken in sunlight. (I think the sunlight washed the color out a little; this looks even bolder in real life.) 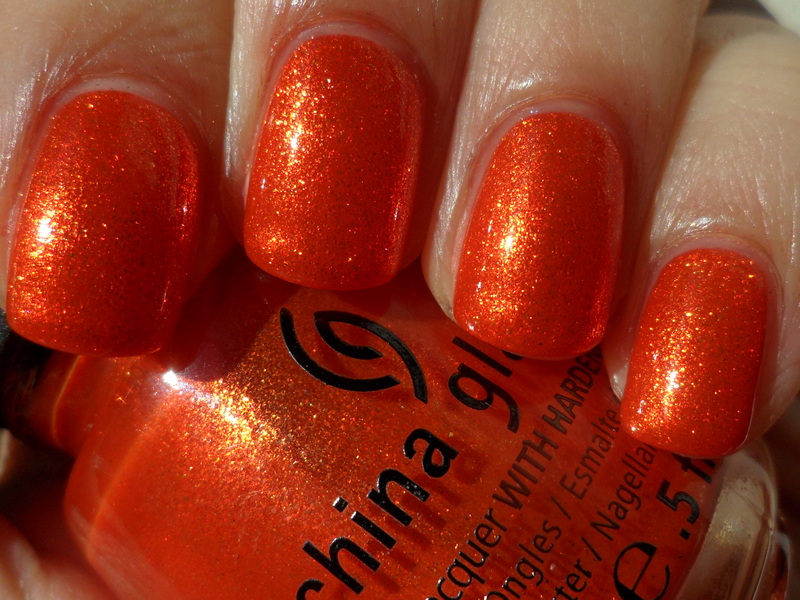 The thick, glitter-dense formula didn’t pose a problem; I got full coverage in two coats. The way the finish turns out smooth (after topcoat) still amazes me. As I apply it I can see how thick I’m laying it on and I can see how much glitter is loaded on my nails, yet it doesn’t feel bumpy at all. And normally I’d expect something with a thick formula to have a longer dry time, but since I only needed two coats and the base is a neon, it dried pretty quickly. The color is a nice, typical traffic-cone neon orange. It’s very glowy; an orange that’s bright like this definitely has a solar quality. I paired this with Milani Hi-Tech on my toes.